UPDATED: Norwegian chess star Magnus Carlsen attracted even more attention at the Chess Olympiad in Tromsø on Tuesday, including that of the country’s prime minister. Erna Solberg was among those huddled around Carlsen’s chess board, and even made his first move, but he surprisingly went on to lose. 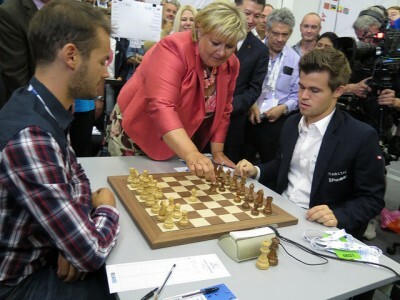 It’s not the first time Solberg has met Carlsen over or around a chess board, and he obligingly let his country’s top politician share the spotlight as she visited the major international event Tuesday afternoon. Then it was back to serious business for Carlsen as he met Ivan Saric from Croatia. The reigning world champion surprisingly lost a match over the weekend, so has been keen to seek revenge since Saturday’s defeat. Carlsen had a tough opening against Saric, seemed to rally, then got into trouble and spent a lot of time thinking. Saric ended up being able to score a victory against the world’s number-one-ranked chess player and Carlsen was unhappy, claiming afterwards that he had a heavy head and that nothing seemed to be working for him. “I overlooked simple things,” he told Norwegian Broadcasting (NRK) afterwards. “Neither creativity nor any of the simple things are there for me right now. It’s not good.” He also said that he didn’t think he should have played on Tuesday, but since Norway was up against a strong nation like Croatia, he played anyway. Carlsen repeated again and again that his brain “just wasn’t functioning” on Tuesday and admitted he and the team were exhausted. He just doesn’t know why. Carlsen had no desire to make excuses, though, and stressed that everyone in the Chess Olympiad is exhausted at this point. “We’re just not tackling it well,” he said of the Norwegian team. His teammates already have admitted to exhaustion, and Simen Agdestein was excused from play on Tuesday. Carlsen had topped the statistics for individual play earlier in the day as the Chess Olympiad entered its second week in Tromsø. Norwegian Broadcasting (NRK) reported that Carlsen led the points list for individual competition after nine rounds in open class first board, with 2,868. Next on the list was Veselin Topalov of Bulgaria with 2,864 and Michael Adams of England with 2,834. Carlsen has claimed himself that he doesn’t think he’s been in great shape during this competition, compared to the string of other top international competition’s he’s won during the past year. After becoming the world chess champion last fall, he went on to win the so-called “triple crown” of chess. Now a golden finish in Tromsø seemed out of reach. The Norwegian team itself hasn’t been doing well as a whole, and the Olympiad is first and foremost a team competition. Teams like those from Armenia, Ukraine and Russia remained favoured. Bae claimed there was still a chance for Norway to win a medal in Tromsø, since individual gold is doled out for every board. In addition to Magnus Carlsen’s initial prospects for gold at the top board, Torbjørn Ringdal Hansen was a medal candidate from the second team on the third board. He took a break from play on Tuesday.